What's the Right U.S. Policy Towards the Kaesong Industrial Complex? Evan Ramstad reports from Seoul that the likely winner in this month's So. Korean Presidential elections, Seoul's former Mayor Lee Myung-bak, is likely to take a harder line with North Korea than his predecessors: Why South Korean Vote May Fray Ties With North. Front-Runner Promises Tougher Stance on Aid; Public's Priorities Shift (Wall Street Journal, Dec 17). Probably not a selling point in the U.S. The export processing zone in North Korea at Kaesong is an important part of South Korea's efforts to improve relations with the North. South Korean companies make products there for domestic use and export using North Korean workers. New zones may be added in the future. The South Koreans wanted the FTA to cover goods from these zones. The final agreement didn't allow this, but created a framework - including a joint U.S.-Korean committee - for deciding whether or not to do so in the future. These provisions are in Annex 22-B. Human Rights Watch objects to these provisions. In fact, it thinks the whole agreement should be abandoned because of this one section. It feels the agreement misses an opportunity to push North Korea even harder towards improvements in the treatment of workers. 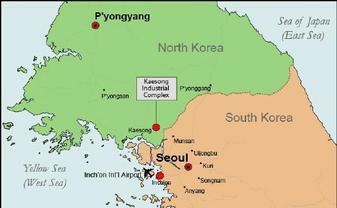 The export-processing zone at Kaeseong or Gaeseong in North Korea has been an important part of So. Korea's outreach to the north. On the other hand, the U.S. is extremely sensitive to the political implications of these goods, and is concerned that the workers producing them are being exploited. The U.S. and So. Korea are working on a Free Trade Agreement (FTA). The first round of negotiations was held in Washington in early June; the next begins July 10 in Seoul. The potential economic and political benefits are attractive for both countries (Are there large potential benefits from a U.S.-S. Korea FTA? , June 18). Jeffrey J. Schott, Scott C. Bradford, and Thomas Moll provide a useful overview of the issues in their recent report: Negotiating the Korea–United States Free Trade Agreement (Institute of International Economics, June 2006).